Baby Magic is the only company we use! Hair and body wash has a pleasant smell and works, not as expensive as other brands. I used it for our first, second and third! I buy it for baby showers even. Definitely recommend. LOVE LOVE LOVE! Won't use anything else! We absolutely love Baby Magic! We won't use any other brand! We combine the Baby Magic wash and lotion daily. It smells amazing and just like a baby and lasts all day long! My sons skin is always soft because of it as well! He is no 1 and we still are using it because I love it so much! I have no complaints about Baby Magic Gentle Hair & Body Wash Soft Scent is a wonderful soap to use on babies. I tend to stick to a different brand of shampoo for my baby, but one day the store was sold out of it so I decided to give this shampoo a chance. I was very pleased with how much it was like the shampoo we normally use. This baby shampoo and body wash smells good and leaves my baby's skin very soft. I love that this soap lathers really well without having to use a whole lot of the product. You get your money's worth because of that. Performance This shampoo and body wash works perfectly. After a long day of playing outside I have a filthy baby, and this soap makes it so easy to clean her in the bathtub. I love that it works good enough that I do not have to harshly scrub on her skin to get her clean. Scent I love the scent of this shampoo and body wash. It has the perfect "baby" scent to it. It smells good and leaves the perfect scent on my daughter's skin. While it's not the best baby body wash in the world, Baby Magic has been my go to whenever I give my daughter a bath. It is very affordable so I don't have to worry about breaking the bank. This body wash is an example of how cheap doesn't always mean you get what you pay for. I have never had any issues with this body wash and I am thankful it does not irritate my little one's skin. 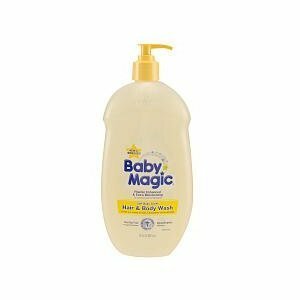 I do believe Baby Magic is much better than Johnson's body wash as far as quality and price. I also like that even though it has that generic baby smell to it, the scent is not overpowering. I do so hate that baby smell and would much rather smell my child's natural scent so I am glad I don't have to worry about smelling the scent of this soap once I am done bathing my daughter. I also love using Baby Magic soap to detangle my daughter's hair when washing it although I do wish that it had moisturizing properties because it leaves her hair rather dry. this truly is baby magic! This is my all time favorite baby shampoo and body wash. Nothing I have ever tried works as well, and nothing I have ever tried smells as good as this does. This smells exactly like how you want a baby to smell. 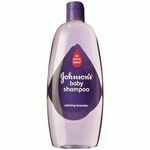 It's light and fresh and has hint of baby powder scent, I am constantly smelling my twins heads. The scent lasts, too. They smell good up through the next time they are bathed. My twins have very sensitive skin and other baby shampoo and body wash have dried their skin out or given them a rash, but Baby Magic truly is magic because it is gentle enough not to dry out or irritate their skin. I love that it has extra vitamins added to make it even better for their skin. The only problem I have with this is that it is not the easiest to find. There is only one store around me where I have been able to find it, if they are out of it I have to order online. I do wish more stores carried it. The Only Brand I Buy! Baby Magic is truly like the next best thing to Johnson&Johnson. It doesn't dry my baby's skin out, it just leaves her feeling soft and clean. I like how when it gets in her eyes, it doesn't bother her at all. It produces a nice amount of bubbles, so if your child wants a bubble bath, this is a great product for that as well. Overall, the price is affordable, and worth ever penny. You get a pretty decent amount of product in the bottle, and a little goes a long way, so you don't have to worry about purchasing wash for your child often. The squirt push top makes it easy to dish a little out when my hands are full washing my daughter up. The only complaint is I wish it came in a bigger bottle! Performance It does everything you want a baby body wash to do. Get the baby clean, and without burning their little eyes. And with all the bubbles, it's fun for them, as well. Scent It smells great! It's not overpowering, but has a light aroma that is pleasing. Baby Magic Gentle Hair and Body Wash (Soft Scent) is standard, run of the mill liquid baby soap. There's not necessarily anything wrong with that. It has an extremely mild scent, and is a basic no frills baby product. It's a bit gentler than "Grins and Giggles" products, and is comparable in many ways to original scented Johnson's Baby Wash. I'm sure it's a great choice for children who have reacted to other stronger scented products without breaking the bank. 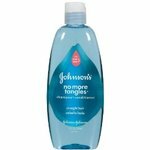 It's a very affordable product and costs a bit less than Johnson's and is higher quality than store brands. Performance Perfectly effective, suds up well, easy on sensitive skin, and is everything you really need a baby wash to be. Scent The scent, as I said above, is very mild and subtle. The closest thing I can compare it to is Johnson's original scent, but it is a little different. I actually kind of prefer it to Johnson's. It has that sort of a general "baby product" smell. It's kind of like a cross between baby powder and Johnson's shampoo, or the scratch and sniff page from "Pat the Bunny" (haha). One of my favorite baby shampoos out on the market. Some of the others that claimed to be gentle still caused my son's eyes to water or his skin felt weird after using it. I really like this one for several reasons. First, it was gentle on his eyes. Also, I didn't feel any weird residue on his skin afterwards like I would often feel after other brands. I also love the easy to use pump. It made it very easy to get more shampoo one handed so that I wouldn't have to take my hand off of my son. I also really liked the scent. It made his hair smell really good without being overpowering. I think this is as close to unscented as you can get. I think the soft scent is just enough to be noticeable without being awkward. I like this product that I have given it to friends as gifts for their baby showers several times. Twice within the last month I have actually gifted it. I also am very pleased with the price point on the product. Johnson's has a larger selection but this is Made in the USA. 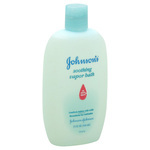 I use Baby Magic and Johnson's products (baby shower gifts). Personally I would purchase Baby Magic based on the fact that it's Made in the USA. Besides that, the product is great. The scent is nice, it gets the baby clean, and their No More Tears chemicals work. Compared to Johnson's, Baby Magic never irritated my baby's eyes. I strongly recommend this! The best baby body wash! I rated Baby Magic Gentle Hair and Body Wash a ten because I love the smell and it's gentle on the skin. It makes my baby smell so good all day long. I also like that it is shampoo and body wash all in one. My baby has eczema and it's the only baby wash that don't make it worse. I tried other baby shampoo and body washes, they all dried out my daughters skin. I also buy the baby magic lotion to and it works great. I still use this shampoo on my five year old son, so it's just not for baby's. Everybody I know say this is the number one brand. I use it because it's hypoallergenic, my doctor said that hypoallergenic products are the best for a newborn baby. It good for a newborn baby when they have cradle cap. My daughters skin always feels so soft and smooth. It's the best shampoo you can use for a newborn baby. Performance It cleans your baby good without drying there skin out. Scent The scent smells so good, my baby smells so fresh and clean all day.